Books Actually in Yong Siak Street carried books and short stories from local authors. A resident cat can be found sitting on the counter top. Modelling pour moi, the fashionable bookworm, Clara Devi. You are here for the bookstores?” the lady at our hostel in Singapore asked. She wears her hair long; has colourful eyelids and nails; with a preference for bright-coloured tight top. I was sitting leisurely at the reception one morning after taking a shower, ready for the day’s book hunting. The hostel lady was there, sorting some envelopes on her desk by the window, and she offered me coffee. When my friends W and C appeared, she asked us about our plans for the day. Hence, the bookstores. As always, the local was right. We went crazy in Bras Basah complex, hopping from one bookstore to another, adding more and more books into our backpack. Personally, I love chaotic bookstores with amazing shopkeepers. The kind of store where you could not really tell which shelves contain which books, but you could always ask the shopkeeper and he would respond as if he were an online catalogue: navigating you in an instant through the small alleys smelled of mildew and old papers to some hidden shelf littered with covers and titles, and there you found the book you were looking for. Littered with Books is a wonderful place if you’re looking for travel books, writer’s interviews, or recipes. The travel shelf is upstairs. This picture is taken by my book-hunting partner, Clara Devi of Lucedale.co. Later that afternoon (or two bags of books later), we sheltered ourselves from the pouring rain and sat at a lovely restaurant in Ann Siang Hill, savouring a pan of hot paella. We had circled this area a few times after leaving Bras Basah, and still not seeing the next bookstore we were looking for. So we asked the waitress if she knew anything about it. Yes, most of the times, I’m in Singapore only for the bookstores. I have been frequenting Singapore for book hunting since they still have this massive bookstore, Borders. I still remember how ecstatic I was when I found a special shelf there, dedicated to books about writing. Woods in the Books. Another bookstore in Yong Siak Street. The street itself is so artsy and picturesque. Cannot stop snapping pictures here. Unlike India, where the price of books is really cheap (the price for 1 book in Indonesia equals to 3 books in India, and I ended up shipping 10 kilograms of books from Jaipur), Singapore may not be the cheapest option to shop for books. However, the options are abundant! Although I was heartbroken after Borders was closed, today I cherished the birth of local indie bookstores around Singapore; that only adds up to more varieties and experience for book-hunters. Not to mention the events, workshops, or book discussions they are sprouting from time to time to keep the community alive! 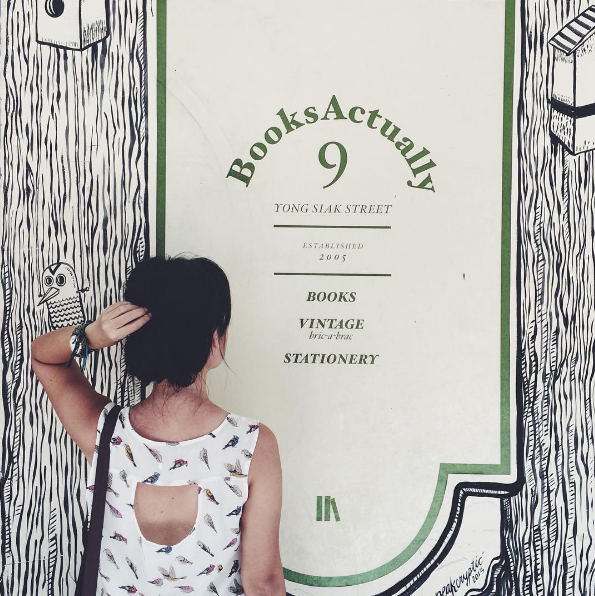 Visiting Singapore soon and thinking about having a one-day walking tour for book hunting? I’ve created this walking route for book shopping in Singapore that may help you navigate your way around! Always start with a good and hearty breakfast! Many food stalls are available in Arab Street, serving Chinese, Malay, Indian, and even Indonesian breakfast from 7 AM. I personally love a warm portion of martabak and teh tarik at Singapore Zam Zam restaurant. From there, walk leisurely along Haji Lane with its lovely murals and picturesque facades. Stores and cafes are still closed in the morning (mostly open around noon), exactly why I love being here at these hours just to stroll along, snap pictures, and feel inspired. A 10-minute walk from Haji Lane, you’ll reach the National Library of Singapore. Why, a library should be in the picture when we’re talking about a literary walk, shouldn’t it? Moreover, we’re talking about a 16-storey library, with gardens in the building that offered a good view of the city: the Courtyard on Level 5, and the Retreat on Level 10. The collections of books go without saying. Find out if there are any exhibitions on the day of your visit. 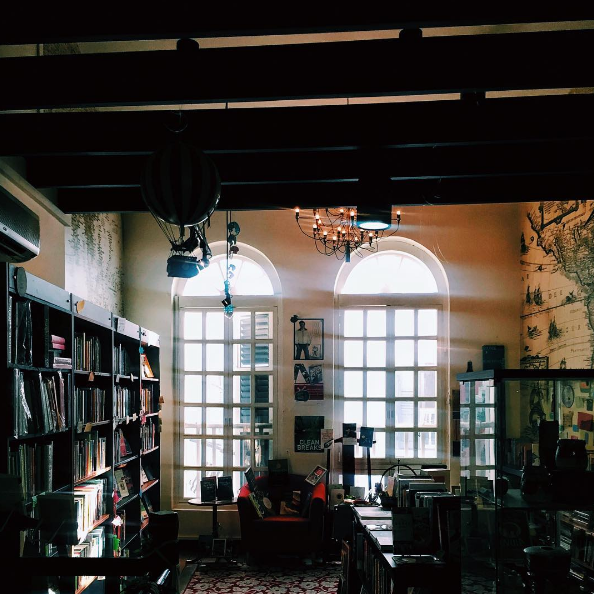 Only 2-minute walk from the Library, the upper floor of Bras Basah Complex is full of ‘oldies’ small bookshops selling rare and antique books, second-hand books, comic books, and many more. Book display and shelving may not be their thing (love chaotic bookshops! ), but they may hide that one gem you’re looking for! Just ask the shopkeeper if you have a particular book in mind. Amazingly, they would remember whether they have the book, and where they shelf it! This is my go-to place to hunt for South Asian books & literature. Find Basheer Graphic Books (#04-19) if you’re into graphic design books: from typography, branding, animation, fashion, architecture, interior design, and many more. *) If you choose this route, you’ll have to go for a 21-minute walk afterwards to our next destination. If you choose the other route below, the distance to our next destination is only 3-minute away. Maxwell Food Centre could be your second option for lunch—if you’d prefer hawker stalls rather than a cafe-like establishment. You may want to try Tian Tian chicken rice, Huang Ji wonton noodles, or Fuzhou oyster cake. It’s a 28-minute walk from Bras Basah complex, and you may think it’s quite far, but here comes the plus point: the location is only 3-minute away from our next stop! After 21-minute walk from The Book Cafe (burn those calories!) or just a 3-minute stroll from Maxwell Food Centre, you’ll arrive in Ann Siang Hill. 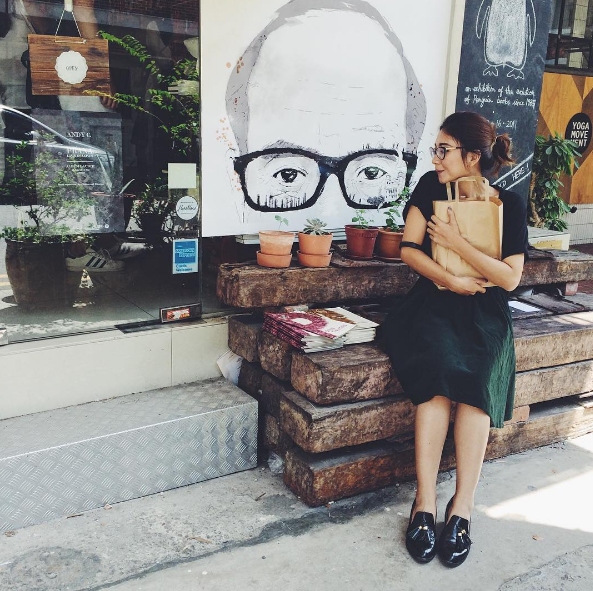 It’s a lovely stretch where you’ll find many concept stores with curated goods as well as Instagram-able cafes. The buildings around this area look beautiful in pastel colours. After Haji Lane in the morning, this could be your afternoon dose of inspired walking! Only 5-minute away, you’ll stumble upon Littered with Books, a beautiful bookstore with special sections for travel and culinary books in the attic; and a section for books about writing & writers downstairs. Couches are provided here and there, so you can flip the pages of your book leisurely. What I love the most is the hand-written notes glued by the owner on each shelves, giving you recommendations on certain titles to read and why you may find them interesting! Have filled your backpack with more books? After a 6-minute walk, what about a quick stop for coffee at The Reading Room before heading to your next destination? With countless books surrounding you from its walls and puffy cushioned sofas to bury your back comfortably, it could be your first option to sit lazily while checking whether you still have enough Singapore dollars to buy more books! The Reading Room’s next door neighbour can be your second option for a cool breeze from the hot Singapore sun. 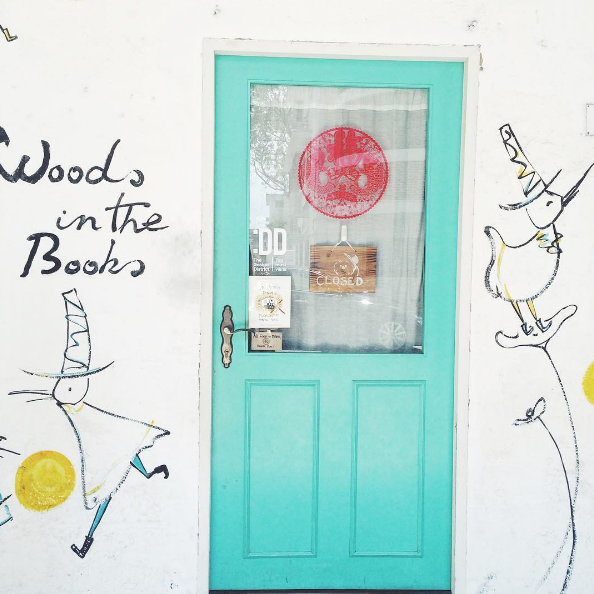 Only a few steps away, Grassroots Book Room is a serene unconventional bookshop with an adjoining cafe. You’ll find books on Chinese literature and history, as well as recipe books. I have an unhealthy addiction towards beautifully-illustrated children’s books. And after a deserving 21-minute walk from The Reading Room, Woods in The Books would come into view. It’s a quaint little bookstore with all kinds of children books to cheer you up: from fiction to nonfiction, in various categories imaginable! This is my go-to bookstore in Singapore to look for works from local authors. A few steps away from Woods in The Books, Books Actually also published anthologies and journals from the newcomers in Singapore’s literary scene. Near the cashier, you would find a stack of Ceriph—a quarterly publication containing prose, poetry, social commentaries, photography, and visual art from local artists. You can take a past issue and pay as you wish by inserting your money into the provided tin-can. There’s a special section containing staff-picked books (I love their picks!) and a resident cat is around if you like to pet it. With your backpack full of books, it’s time to head out to a place where you can flip and glimpse at each book you’ve just bought—peacefully, while having dinner. Have a short 1-minute walk to The Open Door Policy, and celebrate the day with a portion of crab cake or their delicious lamb dish. Have a sip of fresh juice, massage your feet, and open your backpack while waiting for your meals to arrive. Now, you need to decide: which book to read first? Happy walking! And happy book-hunting in Singapore! OMG! I need that writer’s glossary book! !